In a talk titled “Crisis and Hope,” Hamid Dabashi led a powerful discussion on the future of the Iranian Green Movement. A professor of Iranian Studies and Comparative Literature at Columbia University, Dabashi is the author of nineteen books and hosts an online radio show called Week in Green. He argues that Iran is seeing the end in politics of despair and the commencement of a new kind of politics filled with danger. Yet the current empowered youth in Iran are determined to bring about radical change and freedom. These youth are the faces of revolution and the future of Iran. People often associate Iran with harsh autocratic rule. However, Iran has more elections than any other country in the world. These elections occur at the local levels—there are four non-democratic institutions, which have created an Iran of oppression and violence. Dabashi states that, “there is a distinct separation between the illegitimate government and 72 million people. June 2009 brought light to these two separate Irans.” The night after the “rigged” elections, the youth arose in fury. Using cell phones and Internet, people rallied throughout the night. Thousands came to scream “where is my vote” instead of “where is my gun”. The advent of technology has facilitated this revolution. People send text messages and live televised debates between politicians now take place. Famous political photographers have stopped trying to capture the Green Movement. Artists argue that they don’t know what to paint or where to place their camera. The camera is in the mobile phone and in the hand of the activist. It is a social act in itself. Dabashi then turns the conversation away from the Green Movement and addresses Iran in the context of American policy. He claims the Western world has made Iran to be the enemy. The American government has created an image of the “enemy” which was initially Osama bin Laden. Later, it morphed into Saddam Hussein. Today, it is Iran. However, when people strike against the enemy, they think they are attacking a country or an individual rather than the innocent women and children who will be scarred forever. The Western image of Iran needs to change, according to Dabashi. Iran is a fusion of different cultures. Given its geographic location and history, Iran is a combination of African, Indian, Asian, and Middle Eastern culture. The categories and labels that people give Iran are oversimplified. Sanctions on Iran will not work and should not be used. Countries in the West must recognize that the political system in Iran is cleansing itself. Dabashi argues that policymakers must go beyond the hijab and respect a woman’s choice to either wear a headscarf or not. Likewise, they need to reevaluate their policies regarding Iran’s nuclear program. Iran has signed the UN Nonproliferation Treaty (NPT) while Israel, Pakistan, and India have not. Two of the three nations have openly declared access to nuclear weapons and technology. Iran, on the other hand, has nuclear stocks for enrichment which are within the conditions of the NPT. Dabashi asserts that it is unfair to judge Iran for holding nuclear power to promote its domestic sustainable development. The U.S. has openly allowed and funded Israel’s military program, thereby making their complaints against Iran seem hypocritical. The Western world and policymakers must focus on the larger movement and change that is taking place. They must ensure that the Green Movement stays on the front line of debate and discussion. The Green Movement is the third non-violent protest movement in the world. It will soon celebrate its one year anniversary. Iran is like, “a body which one is putting an old dress on. The body is growing and the dress is tearing”. It is imperative to change the image in people’s minds—Iran can and will change. Iran must be made a priority and the Green Movement must get international recognition and support in its struggle for freedom. Hamid Dabashi’s speech was hosted by the Students for Civil Rights in Iran, a student organization on campus designed to promote the sovereignty of Iran and human rights within the nation. 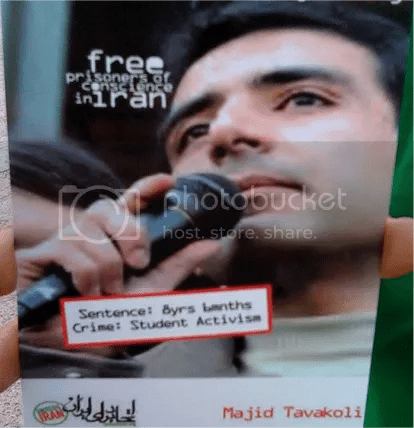 The speech was dedicated to Majid Tavakoli who, along with 16 other political prisoners, went on a hunger strike in protest of the prisoner brutality he experienced. His fast began on May 23rd and has recently become dry. People across the world have begun fasting on his behalf and people in Iran have posted pictures on Facebook proclaiming, “We are all Majid”. Videos of students dressing as Tavakoli while declaring “Where is my vote?” and “We are all Majid” are spread widely on the Internet and on Youtube. Those who have had the courage partake in the Green Movement and challenge oppression and fight for a new and free Iran must be commemorated. Before his talk, Professor Hamid Dabashi spoke to PROSPECT. PROSPECT: How has Iran changed since June 2009 and the controversial reelection of Ahmadinejad? PROSPECT: What are some key elements to ensure that the Green Movement sustains itself? HD: The sustainability of the Green Movement is entirely political. President Obama has inherited a mess from President Bush. Obama and the rest of the world need to ensure that global attention is not diverted. The spotlight must continue to remain on Iran and the Movement. PROSPECT: One of the unique elements of the Green Movement is that it lacks a single leader. India’s freedom movement was led by Gandhi. The American Civil Rights was spearheaded by Martin Luther King Jr. How important is a leader in a nonviolent civil rights movement? HD: The Green Movement is creating its own leader. However, I think it is important that a youth movement requires a youthful leader. Many believe that Mousavi is the leading representative. However, if that is the case, he is my representative. As a result I can criticize him or support him. Another person who has leadership potential is Majid Tavakoli. PROSPECT: What is your vision for Iran? Do you believe that it will be realized in the near future? HD: I see an Iran where people have the same freedoms that every individual has in America. I see an Iran where a person can stand up and say what they believe. This vision is realistic. The people of Iran are paying a heavy price for basic rights. Youth are captured and tortured. Women who are walking down streets are raped. However, people are resilient and the young generation is demanding change. PROSPECT: It is commonly stated that change must be gradual. In Iran there are multiple forms and groups that are targeted and oppressed. Is it possible to fight for so many causes at once? HD: Rights and freedom are something one has to constantly fight for. One cannot just focus on liberating one particular group. Every person which is denied a voice must be represented. A society where any individual is denied their voice is not a free society. We must fight for equal rights for all. PROSPECT: Do you think Iran will set a precedent for the rest of the Middle East? HD: Iran is already setting a precedent. Young people in Baghdad are having pro-America demonstrations. This was unheard of a few years ago. They are gaining inspiration from Iran’s civil rights movement. Obama is able to achieve parts of his agenda because of the Green Movement. The youth have shamed the government. They have weakened Ahmadinejad’s credibility. This has helped the international community’s attempt to achieve its goals. PROSPECT: Is democracy possible in Iran and the Middle East? HD: Of course democracy is possible. It is nonsense to say that democracy is not feasible in the Middle East because democracy is possible anywhere. But bringing democracy to the Middle East will require a change in United States policy. The U.S. is supporting Egypt and Saudi Arabia—neither country is a democracy. The nation will have to understand that once democracy takes its course, leaders who disagree with American ideals may be elected. U.S. leaders must be willing to accept this reality. PROSPECT: What should be the course for US-Iranian relations? HD: There needs to be mutual respect between both countries. In the past, two Americans earned the respect of Iranians. Howard Baskerville went to Iran as a Presbyterian teacher and joined the revolutionaries. Iranians still pay tribute to him and consider him a martyr. Likewise, William Morgan Shuster managed the state’s finances and was appointed by the Iranian Parliament. He supported democracy and freedom. The U.S. should look at these two individuals as a model of how American-Iranian relations can be. The people and the government must aid democracy and support this movement. PROSPECT: Since the late 60s, Americans have not been able to create and sustain a political movement. People may disagree with leaders and foreign policy, but their protests do not seem to retain momentum. Iran has a track record of incredible political movements. What is missing in recent American movements and what can we learn from the Green Movement? HD: In America, we do not allow protests. For example, the February 16 demonstrations in New York were shut down by police. Police officers prevent crowds to gather. They divert people into different places and streets, and as a result, people do not feel as if they are part of something. This is not the case in Iran. Furthermore, Americans do not have as much at stake as the Iranians do. People in Iran are fighting for survival and freedom. This is a cause they deeply care about and therefore will do anything to achieve it.